?Hey boss?? Alex Brighton opened the door to Cane?s office after knocking, poking his head inside. Cane was seated at his desk which was covered with paperwork of all kinds; there was a method to the madness, but he was the only one who knew what it was. How he managed to keep track in the chaos was a mystery, and yet all the bills were paid on time, payroll completed, bank notes processed. The only thing he required was to be left alone when busy -- something Alex was not currently doing. Looking up in mild irritation, Cane eyed the young man expectantly. What? ?There?s a couple officers here. Say they need to talk to you.? Alex?s expression was uncertain. Sighing, Cane straightened up and sat back in his chair. ?All right. Send ?em in then, Alex.? A pair of somber officials dressed in neat gray uniforms filed into the office. Cane didn?t move from his relaxed position until the taller of the two closed the office door behind her. ?The one and only,? he answered easily. ?I?m Inspector Miranti,? the woman replied. She gestured to the shorter male with her and said, ?This is Inspector Stitt.? Stepping closer, she pulled a clear plastic business card from her chest pocket and handed it over to Cane. ?Do you know Lirssa Redbane Sarengrave al Amat?? ?Yeah,? he replied cautiously. The Cajun took the fancy holo card containing all of the Inspector?s credentials, barely glancing at it before frowning at the pair of suits. ?What?s this about?? ?Sir, we sincerely regret to inform you that Ms. al Amat was killed in an accident outside the 11th District Courthouse in Stars End on January 30th.? Inspector Miranti paused there to give Canaan time to absorb the information and react, but he only continued to stare at her. As the growing silence became uncomfortable, she looked aside at her partner and took another tentative step forward. ?We have grief counselors available to speak with you if--? ?I don?t need a grief counselor,? Cane interrupted dully. ?Of course, Mr. Devillier. Everyone processes differently. I understand you worked with Ms. al Amat? Were you two close?? ?She--? Start and stop. Canaan was having trouble concentrating. This wasn?t happening like last time -- when Lirssa?s ship sailed into the sun, there had been a grapevine of gossip that carried the news to his ears. He hadn?t believed it then, refused to accept what could not be physically confirmed. But this was different. Logic added up all the pieces for him in his head so that it made perfect sense. An undeniable, inescapable truth. He closed his eyes. ?Yes.? ?We?re very sorry for your loss.? The words solemn, but earnest. Mind spinning, Cane got up from the chair to stretch his legs and crossed both arms tightly over his chest. ?What happened?? ?She was stabbed,? Stitt said gently. ?Emergency officials were dispatched quickly, but Ms. al Amat expired on the scene.? Cane frowned. ?Expired. You make her sound like something gone bad.? ?I?m sorry.? Inspector Miranti interjected quickly. ?We mean no disrespect to the victim, or to you, sir. The loss of a life is supremely consequential. We?re doing everything within our power to ensure Ms. al Amat receives all the dignity she deserves.? He?d gotten over the poor verb usage before Miranti had even gotten around to apologizing, but let her drone on without interruption until she was finished. It gave him time to think. Cane couldn?t figure out why they?d come to him specifically. The bright image of Lirssa?s father?s face flashed behind his closed eyelids. He?d only met the man once, didn?t like him. And yet he felt a stab of jealousy. It was unlikely he could even be found to inform. Wherever Ali al Amat was, he?d probably never learn of his daughter?s fate, leaving this burden for Cane to bear. The spark of dawning realization burned low but hot in his chest. He opened his eyes. ?It?s been, what? A week? Why are you just telling me this now?? Inspector Miranti?s expression was apologetic. Cane didn?t doubt she felt genuine regret in bringing this news to him. ?We have been unable to locate any relatives; Ms. al Amat did not have a designated next of kin contact. But in our search, we managed to discover that you, sir, are listed as the victim?s executor. In the event that a family member cannot be reached, the disposition of the body falls to the executor.? Cane was falling. Though he?d about guessed as much before asking, the confirmation felt like having the rug pulled out from under his feet. His body felt as though it was stuck in a perpetual state of plummeting to the ground, the swooping sensation in his stomach never quite letting up. His breath left him in a rush as everything, slowly, started sinking in. Lirssa was dead. His girl was gone and she?d saddled him with the aftermath. It was just like her to have never even asked him if it was a responsibility he wanted. Imagining Lir in the midst of deciding this sassy, secret rebellion made him smile ruefully despite the expanding hollow emptiness he felt. ?Well ****.? The Cajun unlocked his arms and ran a hand through his hair, then over his face to scrub the smile and all the hurt away. He looked around the cluttered disarray of his office in search of his phone. Work would have to wait, everything would have to wait now. ?Take me to her.? It didn?t happen the way it?s depicted on TV. He wasn?t standing at a window in an empty, sterile room. There was no dramatic drawing back of the sheet or a curtain to reveal the body. He and the Inspectors, along with the entirely unnecessary grief counselor, were seated in a warm office in plush chairs, in a secluded section of the precinct just one floor up from the morgue. Laying face up on the table in front of him was a picture of Lirssa?s dead body; the ghostly pallor of her skin appearing porcelain smooth, but it didn?t remind him of anything soft. She looked cold and hard, like a cut, polished stone. Unyielding. The girl?s fiery hair had been shorn close to the skull, falling in jagged cuts no more than an inch in length all over. ?What happened to her hair?? Out of all the information he?d taken in over the course of the last few hours, this was this final straw that pushed Cane over the edge. It struck him as oddly funny in the back of his mind, this seemingly inconsequential detail floating among everything else that he?d learned. What was hair compared to a stab wound or the pain she must have felt? And yet he was forced to cover a silent gasp of distress with a calloused fingers. He could feel the hot rush of tears prick the corners of his eyes. What a stupid thing to make him cry. Cane frowned, swallowing the lump that had formed in his throat. He dropped his hand away from his mouth to push the clipboard and photo away from himself. That wasn?t his girl. He didn?t want that image in his head. A better memory burst like stars behind his eyes, so bright and demanding that he closed his eyes to concentrate on it: the way the stage lights emphasized the radiant expression of joy on Lirssa?s face as together they took flight on the silks. That was how he chose to remember her. Impossibly vibrant and alive. He held it together long enough for the Inspectors to tell him about Lirssa?s incarceration and the charges that had been brought against her. It filled him with regret for not knowing any of this when it was happening. But then, she never did like to ask for help. Lirssa was one of the most stubborn, self-sufficient people he knew. There were times she reminded him so much of himself that it wasn?t difficult to imagine they were related. Night had fallen by the time he returned to the house on the cliff. Sal was waiting for him there. His time in Stars End had been a drain on his soul; it was only after the Spaniard drew him into a hug that he felt some semblance of life return to his bones. But as the numbness began to ebb, pain surged into the empty space that was left behind. The Cajun?s too-hot tears turned Sal?s skin red where they landed as he cried against the man?s shoulder for a time. An hour later they stood together on the beach where years of tutelage had taken place between teacher and student. It had taken mere seconds to construct the glass platform on which Cane had laid Lirssa?s body to rest and subsequently set ablaze. Though Lirssa had been a performer all her life, he knew she did not like personal attention. She wouldn?t want the world to see the broken shell of her body, to have herself laid bare for all to stare at and cry over. No, she wanted others to smile, she?d want to be remembered as a light and a joy. Beyond that, Cane had no intention of burying her. The world they lived in was one filled with magic and people with no respect for the balance. ?I... don't want to do that kind of thing, Canaan.? He remembered. He would not leave a body for some reckless idiot to raise because they couldn?t bear to be without her. The only razing that would happen to his girl was what was taking place now. Hellfire of Cane's own creation consumed the empty shell Lirssa?s soul left behind, in the end leaving nothing more than a smoldering pile of ash and dust. A rush of bitter winter wind caught and carried a portion of the ashes away from the glass pyre to mingle with the sand and surf below. Good, Cane thought. A piece of her would remain on the beach forever. He remained motionless beside his lover until the last ember of brittle bone disintegrated. Later, as her ashes were consolidated within a small, burnished bronze box, Cane couldn?t help but note that the world was that much dimmer without Lirssa?s light. 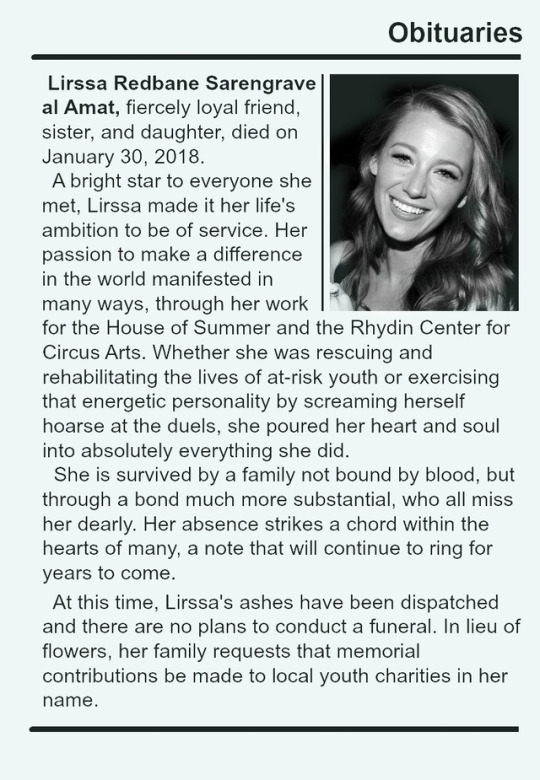 Lirssa's death was not announced until the following week, the day after Valentine's day. None of the staff at RCCA knew about it until Cane came into work that morning with a copy of the local newspaper containing Lirssa's obituary. There was a brief discussion about how best to address the topic with the students; it was ultimately decided to send a letter home with the younger children and to announce it to the older students. Lirssa was well liked as an instructor. Though she'd been gone since the summer--a long enough hiatus that would help ease the sting of the pain--Cane had little desire to witness what was sure to be a flood of tears in response to the news, so he left the task to his senior staff. Cane busied himself with the task of cleaning out her office now that everyone had been made aware. There wasn't much she kept there, barely enough to fill a box, but he did find a stash of knives (both throwing and juggling) which he set aside to keep. A picture of the two of them post-performance joined the keep pile, as well as the outfit she'd worn because it still smelled like her. He got rid of everything else with the cool indifference he knew she expected of him. When the office was stripped of all that had given it life, Cane left for the day so he could do the same to her office at the House of Summer. After that was finished, he stopped by the Shanachie Theater to speak with Mataya, who allowed him to clean out the locker Lirssa had kept in the dressing room. Only a pair of nondescript bobby pins he'd enchanted and given Lirssa nearly 2 years earlier joined the small cache of items Cane intended to keep. The busy day was merely a continuation of the busy week spent dealing with the business and legality of determining the disposition of all property and possession. He'd closed both of her accounts, consolidating the funds and earmarking them to create various scholarships which would be made available to the city's youth. The derelict ship Lirssa called home had even been taken into consideration, but more research would need to be done before he could make the final decision as to its fate. Cane didn't want to take his time, he didn't like to wallow, he didn't want to prolong the inevitable. What he wanted was to get it all taken care of as quickly as possible so he could close the door and move on. The most pressing issue now was the task of finding a pilot willing to do him a huge favor.